In McDonald’s’ continuing effort to bolster its breakfast business, the chain now announces that the Donut Sticks it’s been working on will finally be released on February 20 for a limited time. As a McDonald’s press release lovingly describes: “Donut Sticks are made fresh throughout the morning, prepared in McDonald’s restaurant kitchens until hot, crispy and golden brown for a light and airy texture—never microwaved. 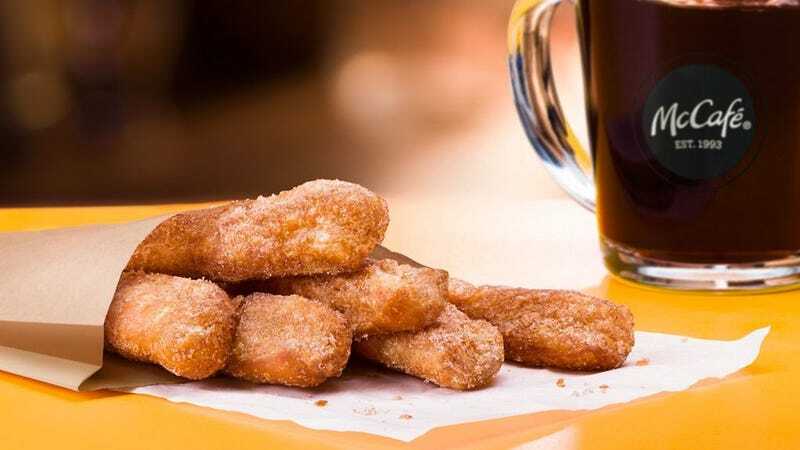 They’re sprinkled with cinnamon sugar for a crunchy outside and soft, doughy inside, and served warm to customers.” A few lucky McDonald’s will also serve the Donut Sticks on Valentine’s Day in advance of the nationwide February 20 rollout. While Linda VanGosen, McDonald’s vice president of menu innovation, stated that the company “looked at several doughnut shapes, tested a variety of doughs and even worked to get the amount of cinnamon sugar just right for the recipe,” we can’t help but think that the churro was a clear precedent. Or at least, Dunkin’s Donut Fries. The announcement follows weeks of speculation about McDonald’s experimental breakfast sticks. Why all the focus on breakfast? CNN explains that “breakfast is the final frontier for the restaurant business”—since most people still breakfast at home, that market is largely untapped. So even though overall fast-food sales flatlined last year, breakfast sales rose 1 percent. McDonald’s breakfast has been in a slump, though, as its all-day breakfast innovation reportedly led to leading to fewer sales in the a.m. and less profit in the later part of the day. The Sticks are an attempt to change that direction, following the release of ginormous triple-decker breakfast sandwiches. Which means we wouldn’t be surprised to see the Donut Sticks make a permanent entry into the McDonald’s breakfast menu: They’re certainly an easier sweet morning treat to pick up via the drive-thru than hotcakes and sausage.